Present for Lindsay tapestry shows a vase of flowers and a wrapped floral cloth present. 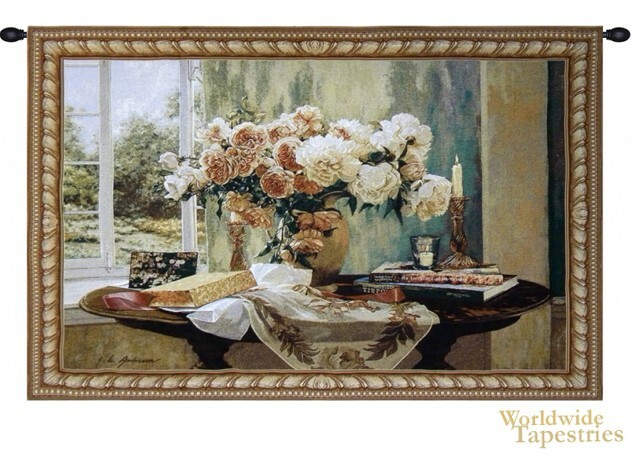 In this scene of peaches, greens, and golds, we see a gorgeous collection of rose peonies in peach colors, with a present with wrapping paper on the table. An open window is seen in the background with a tree filled garden beyond. Present for Lindsay tapestry is backed with a lining and has a tunnel for easy hanging. Note: tapestry rod and tassels, where pictured, are purchased separately.